An evil doctor has taken over the world and created an army of flesh eating zombies. 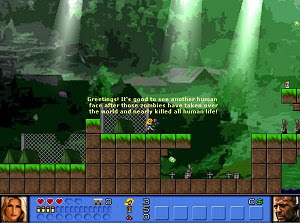 You play as a blonde chick that has to blast her way trough hordes of enemies to save mankind. I've tried to capture the gameplay of good old classic arcades like Contra or Megaman.